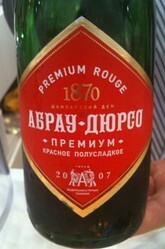 The wine in question was from one of Russia’s oldest wineries, Abrau Durso, which was established in 1870. To taste, it was hugely concentrated with a nose dominated of cherry stones. Abrau Durso were trialing the wine in London to gauge whether there was an appetite for a Russian sparkling wine.